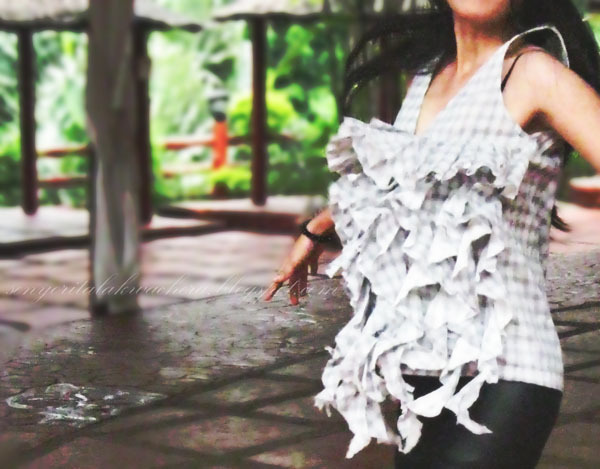 Senyorita Lakwachera: Ripped and raffled blouse. Ripped and raffled blouse + water leggings + black wedge. I like how to play with my old clothes pairing it with a new one to turn it in a new chick style. As you can see I've been using the black wedge for many times now and so is the water leggings; its because I love apparels that I can utilize more. This two pieces is very flexible just see how it fits to my newly created top. what a gorgeous blouse!! love your chic pants and heels!! awesome!! Thanks Marie, I also think it is :) that blouse is also very comfortable, the fabric was just perfect not make you feel bulky about the raffles. nice outfit! you have a great blog ! Fantastic top! Looks great on you! Just found your blog and love it! Following you now! Stop by at my blog! Would be great to be following each other! You've got a really keen eye for style! Love the entire look!